After years of working with, and for, Creative Commons this spring I had an epiphany. Creative Commons is not just about making things “open” its about building a “commons”. What, you say? Thats so obvious. I mean really, commons is part of the name. Maybe so, but my experience is that everyone focuses on how Creative Commons makes things open. We all talk about Open Educational Resources, Open Access, and Open Data. No one talks about the commons. The very idea that there is a commons has, for the most part, been lost. All that changed for me this spring. The commons now looms large in my thinking. So just what is a commons? One type of commons I’ve been exploring and reading about is the natural resource based commons. The air and water are good examples accessible and shared by all. Other examples of natural resource based commons are Swiss alpine pastures, huerta gardens in Spain and Portugal, and salmon fishing in British Columbia, Canada where I live. 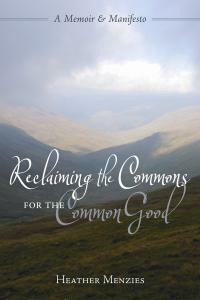 Reclaiming the Commons is both a memoir and a manifesto recounting Menzies’ exploration of how her ancestors in the Highlands of Scotland managed their commons, the real tragedy of the loss of the commons, and the reemergence of the commons as a vital means of re-enfranchising people as responsible participants in common good governance locally and globally. Natural resource based commons are not limitless. They are rivalrous and depleteable. The physical form of natural resources mean that if I have a fish and give it to you I no longer have the fish. Natural resources exist in limited supply with removal and use depleting that supply. The physical form and depletability result in competing rivalrous use interests. Natural resource commons require community management to ensure sustainability and equity of use. Water may be a natural resource based commons but many regions live in drought conditions making water for things like irrigation a commons based resource that requires community management. A commons is a pool of resources, a community that manages them, and the set of rules or agreements by which they are managed. I used to think of community management of natural resource based commons as being implemented by either 1. government which takes on management of commons on behalf of it’s people, or 2. market based systems where natural resource commons are managed based on supply and demand economics. But, I’ve been reading the work of Elinor Ostrom who won the 2009 Nobel prize in Economics for her work studying different commons all around the world. Ostrom’s work shows that natural resource commons can be successfully managed by local communities without any regulation by central authorities or privatization. Government and privatization are not the only two choices. There is a third way – management of the commons by the people directly involved and impacted. The physicality of natural resource commons give them a regional locality. The community in that region has the most familiarity, history, and direct relationship with that natural resource commons and is best situated to manage it. 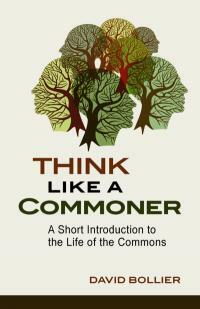 Ostrom’s work on the commmons is substantial and required reading for anyone trying to understand the commons and how it works. She constructed empirically informed frameworks, theories, and models based on study of real world commons. Here are a few samples of her work that I find useful when thinking about the commons. Ostrom’s Institutional Analysis and Development framework reveals the design principles of a commons and provides a structure for analysing the social and ecological interactions of a commons. This framework can be used to model an existing commons and to diagnose problems or explore alternatives. Ostrom primarily studied natural resource commons. The resources in these commons have specific biophysical characteristics that affect their use. In each case there is a community of users who have an interest in or are impacted by the use of commons resources. Inevitably a set of rules evolve that regulate use within the community usually blending together formal legal rules with social norms. Rules define who is eligible to take a position regarding use of the commons, what they must or must not do in their position, whether a decision is made by a single actor or multiple actors, channels of communication among actors as well as the kinds of information that can be transmitted, and rewards or sanctions for particular actions or outcomes. Access: Right to enter defined area and enjoy its benefits without removing any resources. Management: Right to participate in decisions regulating resources or making improvements to infrastructure. Exclusion: Right to participate in the determination of who has, and who does not have, access to and use of resources. Alienation: Right to sell, lease, bequeath, or otherwise transfer any or all of the preceding component rights. The Action Arena is where the social interactions and decisions about the commons occur. It’s where exchanges take place, rules are made, entitlements are allocated, and disputes resolved. Actors choose from among the available action alternatives based on their own interests and desired outcomes. Individual costs and benefits are weighed against the social costs and benefits of the whole community. In many cases regularized patterns of interaction emerge creating social norms of behaviour and establishing a kind of balance or equilibrium. In a natural resource based commons these social interactions result in outcomes that frequently affect not just the actors and community but the resource system and resource units themselves. Evaluative criteria can be such things as economic efficiency, distributional equity, and sustainability. The key take-away for me from all this is the principle that the commons can be self governed. The typical binary options of government regulation or market economics are not the only options. If sustainability is the goal then community-based self-governance using common-property regimes might yield better results. Part of my epiphany this year has been seeing the commons in this new light. Talk of the commons and public good has largely been subjugated by dominant discourse around politics and the economy. But I increasingly see that the commons offers us an alternative way forward, a kind of middle ground balancing the role of government and markets. With the world increasingly divided into haves and have nots, rich and poor, a commons approach that addresses the needs and interests of the public seems like a long overdue and necessary antidote. Around the world governments are increasingly converting natural resource based commons, historically managed on behalf of the public by the government, into property which is leased or sold to businesses who manage the resources. These governments believe that markets are a better way of managing commons than government regulation. I’d never really thought about it before but Robin Hood, the popular children’s story, is really a story about the commons. Essentially the king takes pastures, forests, wild game, and water used by commoners and declares them his own private property. Commoners are evicted from the land, fences and hedges erected and the sheriff and his men given authority to ensure no commoner poaches game from the kings land. Contemporary examples of commons enclosure are numerous. Government agreements allow mining companies to extract minerals from public lands, timber companies to clear cut public forests, oil companies to drill in pristine wilderness areas, and commercial trawlers to decimate coastal fisheries. Management of commons based on market systems tends to result in over exploitation as pursuit of profits and power override public interests. Natural resource based commons have no human producer. Humans are users only. But there are lots of other forms of commons that humans produce. Highways, roads, sidewalks, and public squares for example. 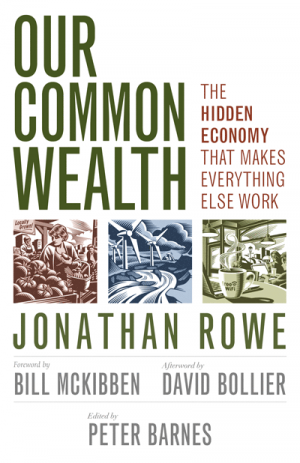 Jonathan Rowe’s book Our Common Wealth – The Hidden Economy That Makes Everything Else Work does a good job of exploring how such public spaces are a form of commons that we share. Rowe expands the commons to include languages, cultures, and technologies. The Internet is a kind of commons. He shows how there is a symbiotic relationship between the commons, the economy, and even our personal and planetary well-being. And then there is the knowledge and culture commons, the creative commons in which I work. There are several aspects of the knowledge and culture commons that make it different from natural resource based commons. One difference is the inherent nature of knowledge and culture. Knowledge and culture are non-rivalrous and non-depletable. If I share an idea or some knowledge with you we both end up with the idea and knowledge. If I sing a song you too can sing it with me. Giving it to you does not mean I no longer have it. The non-rivalrous and non-depleteable nature of the knowledge and culture commons mean that the rules and norms for community management of knowledge and culture commons can, and ought to, be different from how natural resource based commons are managed. However interestingly the global default is to apply property law and copyright to knowledge and culture commons resources creating an artificial scarcity that makes them more like natural resource based commons. This artificial scarcity is time-limited though as all knowledge and culture resources eventually pass into the public domain the name we’ve given to the knowledge and culture commons. It’s intriguing to revisit Elinor Ostrom’s models and frameworks and explore how they might be modified to fit with this alternative form of commons. Its a challenge to transition from a model based on scarcity to a model based on abundance. The biophysical form of knowledge and culture is increasingly digital. Digital based resources can be copied, shared, distributed and used at costs which approach zero dollars and at a scale that makes them increasingly accessible to the entire world. The knowledge and culture commons is as much a global commons as a local one. I’m increasingly seeing the knowledge and culture commons as having two forms; 1. a large global commons comprised of all open and shared creative works, and 2. a local commons made up of curated collection of resources drawn from the global commons that have local relevance and have been customized to fit local needs. I was delighted to have my early exploration of the commons in 2014, bolstered by the arrival of Ryan Merkley as Creative Commons new CEO. Ryan places a strong emphasis on the importance of building the commons movement and establishing a vast pool of free and open content online: data, academic research, educational curriculum, videos, music, pictures, and more. Under Ryan’s leadership Creative Commons published The State of The Commons. This report succinctly documents the growth of the commons. 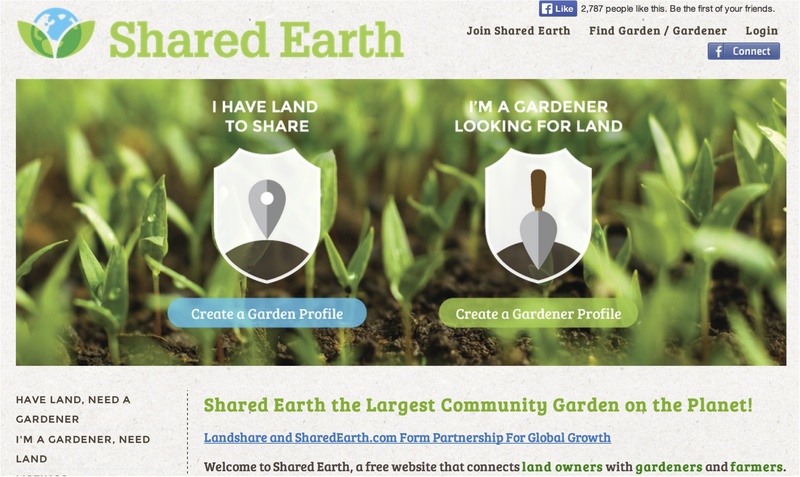 It also shows what parts of the world are contributing to the commons. Ryan also encouraged us to re-examine the goals and work Creative Commons is engaged in and encouraged a re-imagining. The resulting sharing of ideas among my peers was inspiring. Here are some of the ideas I put forward that reflect my thinking about the Commons. 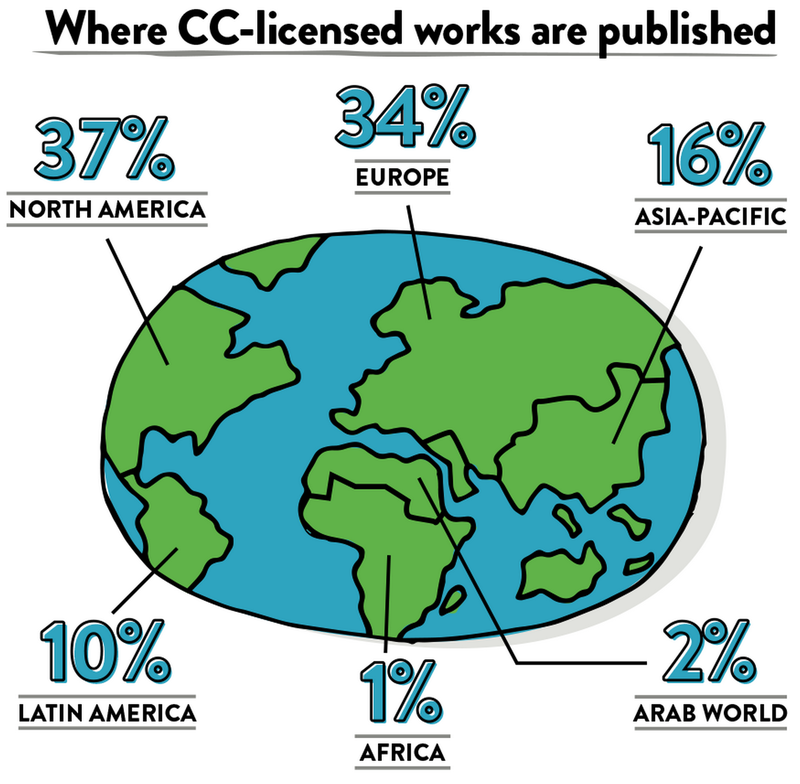 Creative Commons is currently doing a great job at enabling sharing of creative works. But we don’t know why people are sharing. We don’t know what their intent is. In the context of Elinor Ostrom’s framework Creative Commons has established some great rules-in-use, but we have not put in place a complementary technical component to support the community based social interactions involved in producing and managing the commons. I imagine a technical component, added to the Creative Commons license, that allows creators to express intent and solicit the support of the open community in achieving it. Once the why of sharing is known so much more can happen. Each expression of intent is a Creative Commons value proposition statement. In addition to stating why they are sharing I think it is equally important for Creative Commons to enable the sharer to have a means for saying how others can help them achieve their aim. Adding technical functionality that allows sharers to seek the help of others in achieving the aim associated with sharing adds a social component to Creative Commons license. We connect creators to each other – for all kinds of reasons. I imagine it as enabling the development of creative works that require multiple talents – someone for the video, another person for the audio, musicians, writers, .. Collective content creation through collaboration. And many other use cases. I see this as having the potential to migrate Creative Commons from simply being a license that is put on content to an enabler of connections between people. Creative Commons will have not just a content value proposition but a social one. Given this focus I suggested the following as a area of focus for maximizing impact. Creative Commons can have the most impact by focusing in on purposeful sharing. A great deal of Creative Commons use is secondary – sharing as an add-on to some other primary function or purpose, sharing as an act of generosity, sharing as an expression of values based on moral principles, sharing in response to mandate. Much of this sharing lacks an expressed explicit goal, intent, or purpose – sharing with unexpressed, but hoped for consequences. Creative Commons can amplify impact by enabling expression of purposeful sharing and rallying the help of others in achieving sharing goals. A great deal of sharing and CC use is by autonomous individual users or organizations acting on their own. CC can generate greater impact by creating a mechanism for the formation of social networks and collaborations around CC licensed works. The opportunities Creative Commons is missing are not some sector we’ve ignored but the social dimension of sharing. The formation of social networks of Creative Commons users collectively working together on achieving some shared goal is a missing piece Creative Commons is positioned to enable. Moving Creative Commons use from a form of individual expression of rules and permissions to Creative Commons use as a form of collective action will magnify impact. My one metric is – User expressed value (or user expressed ROI). Ask users how their use of CC generates value. This can be achieved by adding to CC tools a mechanism for expression of purpose, a means of inviting others to join in achieving that purpose, and a method for showing progress and outcome. CC use generates diverse forms of value. It can be financial – money saved or revenue earned. It can be a gift or altruistic. It can generate personal value, or generate value for others, or both. CC value takes a myriad of forms. CC value is generated through personal and group action. An individual, a corporation, a government can all generate value through CC use. The people, stories, and values associated with CC use are inspirational. User expression of CC value is a mini-human interest story revealing new ways of doing things, new outcomes. Users know why they use CC and the value it generates. We should invite them to express the value they are generating. My one metric is – user expressed value. From this one metric a diverse range of value will emerge for which additional metrics can be defined. And finally Ryan asked us, What does winning look like? A move away from GDP as a measure of health of a country to “”quality of life”” indicators that evaluate the well-being of a society based more on environmental stewardship, democratic participation in society, equitable distribution of wealth, good health, and contributions to and use of the commons. Winning means Creative Commons and metrics associated with Creative Commons are used as one of the quality of life indicators measuring the economic and social well-being of a nation and the world. Winning means quality of life measures and global well-being inform and affect the decisions and actions of individuals, communities, organizations, businesses, and government. Winning means CC use is a key means of enabling quality of life. Winning means a change of state from accumulation of personal wealth, personal property, independence and autonomy to shared wealth, shared property, and creative collaboration with others. Intermediate mile posts include a recognition that profit-making pursuits have limited scale and sustainability. Mile posts include replacing or supplementing the use of profit-making practices with commons-making practices for innovation, scale, and sustainability. Winning is not necessarily completely replacing profit-making with common-making but rather a balancing of the two and a symbiotic relationship. Winning is based on abundance not scarcity. Winning is a move away form the market consumerism economy based on scarcity to a sharing economy based on abundance with Creative Commons being a key enabler. Accompanying this is a surge of participation, creativity and innovation. Individual acts of sharing are as important as government and market forces. Winning means Creative Commons use solves big global social and economic problems and in doing so leads to growing understanding of the importance of balancing private sector pursuit of profit with the common pursuits building common wealth. Winning means distributed, networked collaborative production builds out common wealth and at the same time reduces the reliance on personal ownership replacing it with shared access and permission to use (within limits). Winning is a form of global activism that benefits all humanity without regard to national boundaries. There are a lot of ways this can be quantified. Currently sharing is “”off the books”” and not tracked as a means of social or economic well-being. Current societal measures focus on growth as measured by production and consumption. However, the emergence of a “”sharing economy”” brings with it the opportunity to measure sharing in economic and social terms. People are deriving income and other non-monetary rewards from sharing. This manifests itself as a diversification and expansion of suppliers, better usage of existing resources, and a desire to make the world a better place. Metrics associated with sharing recognize the shortcomings of unlimited growth in an increasingly resource limited world, and the growing inequitable distribution of wealth. Sharing saves money, amplifies participation, creates easy access to goods and services, and leads to more abundance. Metrics should measure not just the number of resources being produced but the number of people producing those resources and the benefits to both the creator, downstream users, and society as a whole. I share these ideas not to suggest that Creative Commons will implement them but as a way of showing how a shift of emphasis from “open” to “commons” generates different concepts and strategies. Focusing on the Commons has led me to see the work we are all engaged in differently. It has been exciting to discover a commons-based alternative to government and market based forces. Going in to 2015 I look forward to balancing talk of the global economy with talk of a global commons. One where everyday citizens can participate independent of government and market pooling their knowledge and creativity as an expression of kindred spirit and for the common good of all. Joy to the Commons and a Happy New Year all. 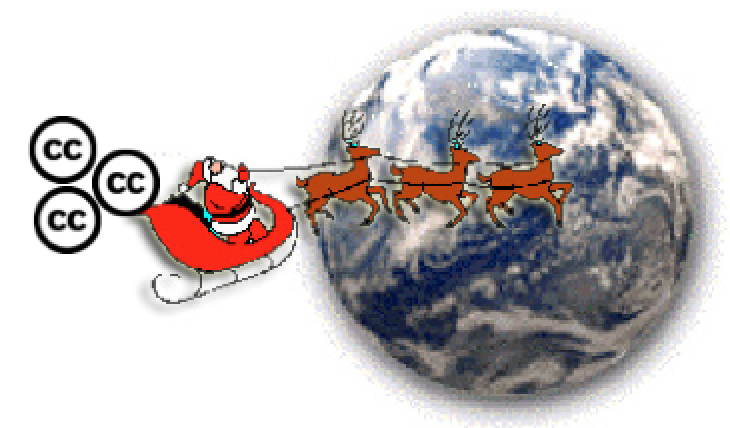 All I want for Christmas is for the world to be more open. But I know from my interactions all around the world that most people struggle to understand what open is and its implications. New open models require a rethinking of traditional models whether they be education models, business models, models of government, models of research, models of publishing, music, or the arts. And of course new models can be scary. They threaten the status quo, they challenge pre-conceived notions on how things work, and generate fear of the unknown. So I’ve put on my Santa hat and here, on Christmas Eve day, I’m working on what I think of as a gift for the world – new models for a new year. This is a gift we unwrap together with an open mind. Lets get started. Awareness – open models are a new concept most people haven’t even heard of. With new models for a new year I aim to make new open models visible. By making you conscious of them I hope you begin to consider them as options, choices you make in how you do your work and how you live your life. Responding to and overcoming the fear reaction. Almost everyone initially expresses a great deal of fear over new open models. With new models for a new year I aim to alleviate those fears. Looking at examples. One of the best ways to understand new open models is to look at real examples. Hearing the stories and use cases of those who have successfully adopted new open models creates a sense of possibility, soothes the fears, and inspires. Trying it out. Once a certain level of comfort has been achieved you’ll begin to see how you can make use of open models personally. As a gift I hope you’ll play with new models for a new year, dip your toe in and try using something that is open. Going open yourself. Once you’ve sampled someone else’s open work and experienced the benefits I hope you begin thinking about making your own work open – perhaps initially in a small way but gradually more and more. Adopting open as a cornerstone of practice. Once you get to this stage you’re in all the way and usually become an advocate of new open mdodels who won’t go back. Spreading open. If you adopt an open model in one area (lets say Open Educational Resources) you’ll become interested in other areas of openness (lets say open policy, or open data, or open access). You’ll start to see the synergistic benefits of adopting more and more open models. The cumulative benefits of multiple forms of openness are greater than each individually. I aim to get you to stages 5, 6, and 7. But to get to that gift the wrappings associated with the earlier stages must first be removed. We all unwrap gifts in different ways. I’m going to start in the middle with stage 3 and use examples to work through the earlier stages and to lead to the more advanced stages. Here are some wonderful examples of people using new models of openness. New models work for both the public and private sector. Both the public and the private sectors can realize social and economic benefits through open models that cannot be attained in any other way. This is an important part of the gift so lets unwrap both the public and private sector aspects of new open models. The benefits of openness are often more readily understood in the public sector. The basic tenet of open models in the public sector is that public funds should result in public goods. The public should get what it paid for. I can see you all nodding. Yes, you say money I pay in taxes should result in goods and services I have access to. Yet, the truth is under current models this is not typically the case. Lets take research. 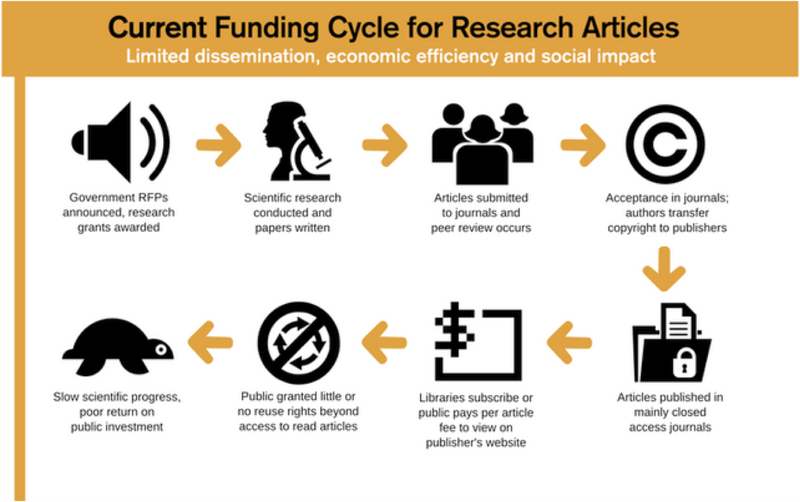 This diagram shows the current funding cycle for research. As you can see the public pays for research and then pays again to get access to the results of that research. This limits dissemination, economic efficiency, and social impact. New open models change that process in subtle but important ways that ensure the public does get access to what it pays for as shown in this diagram. As you can see new open models maximize dissemination, economic efficiency, and social impact. These are all fantastic in their own right and the Open Government Partnership maps out many more ways governments are pursuing new open models. In the new year I expect to see new open models spread from single to multiple use cases within these early adopters and more public sector organizations to follow suit. For me the real potential of new open models exists in the combinatorial effect of combining open models. This is “stage 7 spreading open” I describe in my progression at the start of this post. When public sector organizations adopt openness as a new operating principle across all their activities the combined impact will be even greater. Let me give an example. 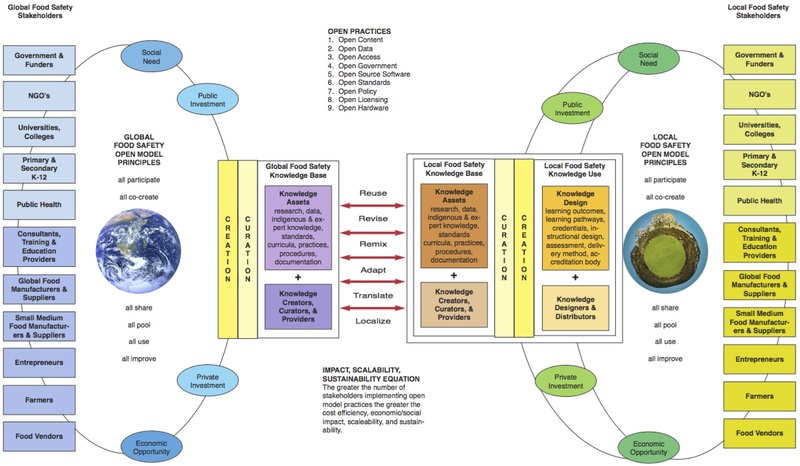 One of the projects I’m involved with through my work at Creative Commons is the Global Food Safety Partnership (GFSP). This is a World Bank public-private initiative dedicated to improving the safety of food in middle-income and developing countries. Imagine your public sector organization has responsibilities for food safety. At a very practical level one of the things you’ll need is a training program for food inspectors. Here’s my take on how you could combine multiple means of openness into a whole new approach to putting that training program together. Step 1: Open License Existing Resources: As a publicly funded agency over the years funds will have been invested in a wide range of standards, competency frameworks of skills and knowledge inspectors require, training manuals, curricula and other resources. As with the research example we saw earlier typically these resources are held all rights reserved with no public access. These legacy resources can all be shared openly by digitizing them and licensing them with a Creative Commons license. This one activity alone, which essentially costs zero additional dollars, leverages and makes available for reuse a large body of existing resources and begins to fulfill your obligation to give the public what it paid for. Step 3: Open License by Default: Adopt a Creative Commons CC BY license as default. This license makes all content (such as curricula developed by developers, marketing and student recruitment resources, etc.) shareable with the public that paid for it. Commercial use of the resource is allowed. The resources can be reused, revised, remixed and redistributed allowing all interested parties to utilize it. Resource use requires attribution be given to the developer. Step 4: Require Open Educational Resources: Base long term strategy for scaling and sustaining the food inspectors program on Open Educational Resources (OER). This enhances speed of updates, distribution, localization, and translation. It also significantly reduces costs for design, development, delivery, and participation. Step 5: Use Open Design & Open File Formats: Require developers of the food inspectors training program to make use of existing OER as much as possible when designing and developing training programs. Emphasize the importance of developing all resources and OER as digital resources using open file formats to ensure they are editable and modifiable. Step 6: Build Open Development Networks: Facilitate matchmaking between those looking for OER and those that have OER. Food inspection is a global need. 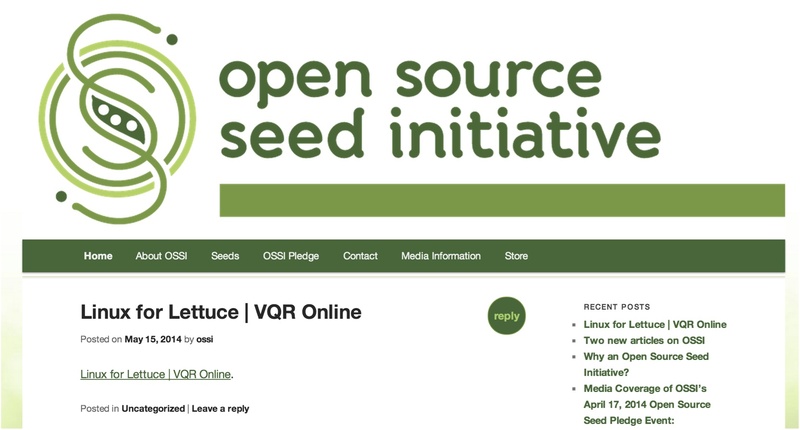 Build a network of developers who all collectively work on shared food inspection OER they have a mutual need for and coordinate development of new resources across the network. Step 7: Design for Open Pedagogy: Adopt teaching and learning methods that leverage the open nature of the learning resources and the open web (both resources and social networks). This includes connecting trainees to people and resources on the open web and having students actively modify and improve training materials. Step 8: Open Delivery: Open up delivery to wide range of service providers who qualify in part based on their expertise in the above and a proven ability to use educational technology. Step 9: Open Repository: Create a repository on the web, open to all, where openly licensed resources associated with the food inspectors training program are kept. Establish repository librarian like role for managing the collection of resources, ensuring they are appropriately tagged with meta-data (use Learning Resource Meta-data Initiative LRMI), and for curating collections of resources for multi-purpose use. Step 10: Open Marketing and Recruitment: Develop (and openly license) marketing resources that recruit participants based on the unique value add (including cost/time savings and quality) associated with a food inspector training program that uses open models. Step 11: Open Analytics: Openly publish a set of analytics/data that define program success. (Analytics could be associated with learning, completion, costs, networks, …) Openly license (using CC0) and transparently report out analytics/data on an ongoing basis. Step 12: Open Access: Publish any research results that come out of studies done on the food inspectors program and the analytics using Open Access (OA). Provide free, immediate, permanent online access to the full text of research articles for anyone, webwide. 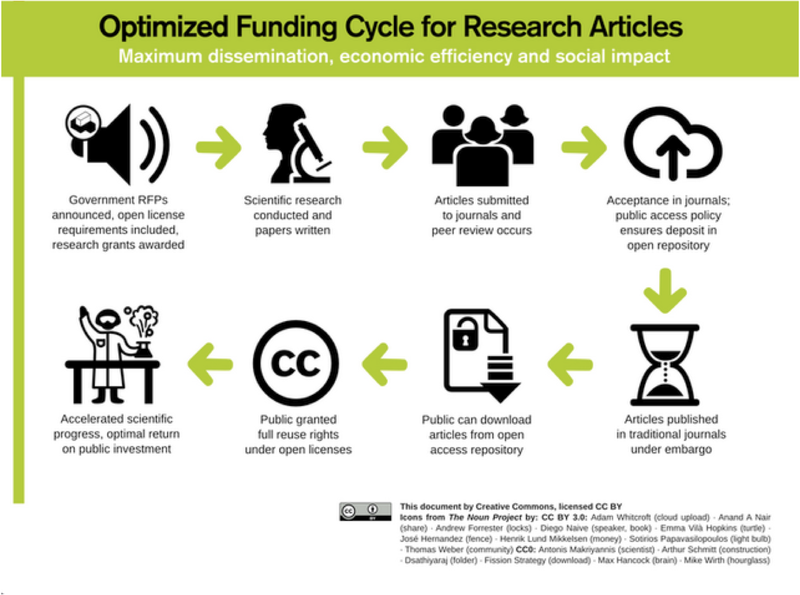 This can be done using open access research journals (the golden road of OA) or through archiving articles in open repositories or on the open web (the green road of OA). Step 13: Open Community: Build an open community around the training including students, developers, suppliers, graduates, … Engage open community in contributing to improvement of the training program, and formation of local, regional, national, and international partnerships. I know this is a very specific example. But I hope it conveys something of the spreading open thinking that can come to bear on traditional practices. Combining open policy, open educational resources, open access and all the other forms of openness described above increases the overall impact and benefits associated with the approach. Limiting adoption of openness to just one small area also limits impact. Perhaps by now you’re going OK, I see how new open models can be useful in the public sector but I’m in the private sector how do open models work for me? How can I use open models and still make a living? New models for a new year is one of those gifts with multiple presents inside. This is a gift that just keeps on giving. We’ve unwrapped new open models in the public sector, lets look at examples in the private sector. I’ve grouped these examples by industry sector. At the end of each example I’ve provided, in italics, a mini description of how they earn revenue. The Noun Project: The Noun Project is a platform empowering the community to build a global visual language of icons and symbols that everyone can understand. Icons are designed and contributed by designers from around the world. All icons are licensed using Creative Commons and free to use as long as attribution is given to the creator. Pricing and money comes in to play if you want to use the icons without giving attribution. Flickr: Flickr is one of the largest photo management and sharing platforms in the world. Flickr lets you store, sort, search and share photos online. Flickr provides Creative Commons license options right from within the platform. Many Flickr users have chosen to offer their work under a Creative Commons license, and you can browse, search and download their photos under each type of license. 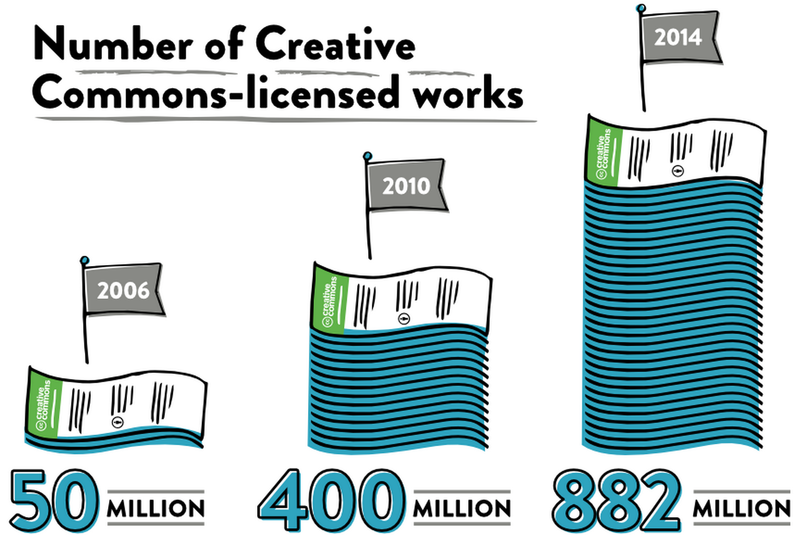 At http://www.flickr.com/creativecommons you can see the more than 280 million Creative Commons licensed photos users have contributed. Use of Flickr is free but each user is given a maximum limit of 1 terabyte of storage. If you want more than that you have to pay. If you want your photo collection to be ad free you have to pay for a Ad-free subscription account. Flickr also provides printing services for a fee. Pixabay: On Pixabay you may find and share images free of copyrights. All pictures are published under Creative Commons public domain deed CC0. Sponsored images are shown to finance Pixabay and to provide a choice of professional photos. Sponsored images cost money. Jamendo: Jamendo offers more than 350,000 free music tracks licensed under Creative Commons, all available for streaming and unlimited download without ads. It allows the public to discover thousands of artists of all genres who have chosen to distribute their music independently outside the traditional system of collecting societies. Jamendo artists can choose to join the Jamendo PRO service that allows them to sell commercial licenses of their music for professional uses, such as music synchronization for audio-visual productions or broadcasting in public spaces. You can search for music on Jamendo using the CC Search tool or directly on the Jamendo web site. ccMixter: ccMixter is a community music site featuring remixes licensed under Creative Commons where you can listen to, sample, mash-up, or interact with music in whatever way you want. One out of six uploads to ccMixter are used in a YouTube video, Flickr moving image, podcast, compilation album and thousands of other places all over the web. ccMixter is ad free and free to creators and listeners. Funding is generated through sales of memberships to artists clubs giving you an inside access and experience with the artist including access to things like Digital-LPs, CD-quality downloads, private blogs and other unique things you can’t get anywhere else. SoundCloud is a social sound platform for people to create and share music and sounds. Recording and uploading sounds to SoundCloud lets people easily share them privately with their friends or publicly to blogs, sites and social networks. Many SoundCloud songs and sounds are licensed with Creative Commons. Use the url http://soundcloud.com/creativecommons to see SoundCloud sounds and songs licensed with Creative Commons. Certain features of the Platform are only available to registered users who subscribe for a “Pro” or “Pro Unlimited” account. These paid accounts provide extensive stats such as count plays, likes, comments, downloads, who’s playing your sounds and where they are. MuseScore: MuseScore: provides free and open source software that allows musicians to quickly create sheet music. They also provide a space where you can share your sheet music and comment on others. MuseScore lets people share music under all rights reserved or openly license their music using Creative Commons licenses. For a fee you can get a “pro” account where you have unlimited storage, detailed stats on how popular your scores are, and no ads. Jonathan Coulton: a professional musician who uses open business models. See The New Music Biz: Cracking the Code to Online Success video explaining how he does this. Boundless: Boundless is building an innovative learning platform by curating the world’s best open educational resources in 20+ subjects and delivering interactive learning tools to college students. Students at thousands of colleges are ditching expensive textbooks and discovering Boundless Learning Technologies that go way beyond traditional books. Boundless textbooks are available for free download as a .pdf. Boundless makes money from advertising embedded in the free, online education materials on their web site. Paid premium access gives you access to the book in their learning platform across multiple channels, including mobile, website, and iBooks. Pratham Books: Pratham Books has been a front-runner in adopting a Creative Commons licensing framework and in the last 5 years has released over 400 stories and hundreds of illustrations under a Creative Commons CC BY or CC BY-SA license. Their vision is to put ‘a book in every child’s hand’. It makes money by selling hard copy print versions. Because the books are licensed with CC licenses other organizations and individuals have converted their books to audio, Braille, and DAISY giving visually impaired access to the books and saving Pratham the cost of doing so themselves. Autodesk: In July 2013 Autodesk announced that its Media & Entertainment (M&E) support and learning content for its 2014 product line is now live and available under Creative Commons (CC) licensing; that equates to 20,000 pages of documentation, 70 videos and 140 downloadable 3D asset files. Autodesk also plans to publish product help materials, its Knowledge Base and Discussion Forums, as well as past and future training content from Autodesk University under the Creative Commons model. This is all part of Autodesk’s ongoing support of students’ pursuit of careers in science, technology, engineering and math (STEM) fields. Autodesk’s goal is to ensure the next generation of designers, engineers and digital artists have great training and free access to the same software that professionals use every day. Autodesk makes its money from its software. YouTube: YouTube has built into its platform the option of posting a video to YouTube using a Creative Commons license. As of July 2012 the YouTube Creative Commons video library contained over 4 million videos from organizations such as C-SPAN, PublicResource.org, Voice of America, and Al Jazeera. From the YouTube home page if you type in your search term followed by a comma and then “creativecommons” the videos returned are CC licensed. http://www.youtube.com/creativecommons lets you see the most viewed and most reused Creative Commons licensed videos. Not only can you can mark your videos with a Creative Commons license when uploading them to YouTube you can also incorporate the millions of Creative Commons-licensed videos on YouTube when creating your own videos using the YouTube Video Editor. Within the YouTube Video Editor you can click on the CC tab to find content available under a Creative Commons license. YouTube and its users make money through advertising. Vimeo: Vimeo makes it easy to upload and share videos. You can share a video publicly or privately. Vimeo is also a community platform enabling you to pick filmmakers you want to subscribe to, receive updates from, and send messages to. Many Vimeo entrepreneurs and artists use Creative Commons licenses to gain exposure, widespread distribution, and secure a return on their creative investment. Vimeo has integrated Creative Commons license choices right into their platform. For a fee Vimeo provides users with ftp and dropbox integration, mobile/tablet/TV compatibility, customizable video player, html5 compatibility, etc. Vimeo On Demand supports users interested in renting or selling their videos. Vimeo’s Tip Jar lets fans to show their appreciation for videos with small cash payments to the creator. IBM. See A history of IBM’s open-source involvement and strategy for a description of their thinking. Red Hat: Red Hat provides a portfolio of products and services in support of enterprise adoption of Linux open source software. Red Hat provides solutions to more than 90% of the Fortune 500 companies. Open source software makes vendor lock-in a thing of the past. Linux is free open source software. Red Hat makes its money providing support, consulting, and training services for that software. Android: Android is open source software and Google releases the source code under the Apache License. According to Wikipedia as of November 2013, Android’s share of the global smartphone market, led by Samsung products, has reached 80%. The open source nature of Android lets third party’s rapidly produce apps. As of May 2013, 48 billion apps have been installed from the Google Play store, and as of September 3, 2013, 1 billion Android devices have been activated. The software is free and open, the phones, tablets and other devices using the software cost money – as do many of the apps. figshare: figshare is a platform that allows researchers to publish all of their data in a citable, searchable and sharable manner. All figures, media, poster, papers and multiple file uploads (filesets) are published under a CC-BY license. All datasets are published under CC0. figshare offers unlimited storage space for data that is made publicly available on the site, and 1GB of free storage space for users looking for a secure, private area to store their research. Users of the site maintain full control over the management of their research whilst benefiting from global access, version control and secure backups in the cloud. For a fee figshare provides users with larger private storage, larger file size limits, and collaborative spaces. figshare also does custom-branded spaces for institutions for a fee. This is by no means a comprehensive list of all private sector corporate entities using new open models, merely a sampling. There are many more. But you can see that open models do not preclude revenue generation and earning a living. 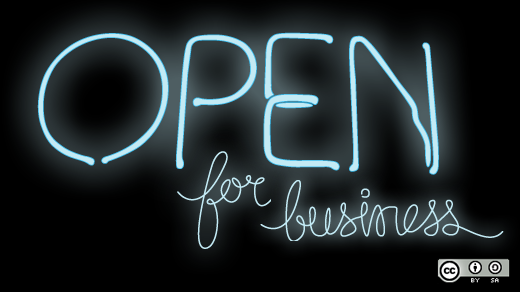 New open models can be very successful business strategies. There is one more part to this gift that lies at the very core of new open models. The gift within the gift. Lets unwrap the fundamental building blocks on which new open models are built. New open models are built on three fundamental building blocks – digital, free, and open. There are lots of models that use just one or two of these building blocks but the new emerging models I’m referencing use all three. The bits and bytes of digital things are fundamentally different than the atoms of physical things. Technology advances are rapidly increasing bandwidth, storage, and computing processing speeds. Semiconductor chips roughly double the number of transistors they hold every eighteen months. The number of bytes that can be saved on a given area of hard disk doubles every year. The speed at which data can be transferred over a fiber-optic cable doubles every nine months. At the same time costs associated with processors, storage and bandwidth halves at the same rate. The digital building block uniquely provides faster, better, cheaper. At a practical level the costs to store, copy and distribute digital things like images, music, books and data begins to approach $0. The physical realm of atoms and the economics associated with it are based on scarcity. Digital enables abundance. Scarcity in the digital realm is almost always artificially created. As the cost of digital approaches $0 it becomes possible to provide everyone digital resources for free. Furthermore if I have something that is digital and I give you a copy of it, I still have it. This is dramatically different than what happens in the world of physical things. The free building block involves shifting your strategy from conserving resources as scarce commodities to treating them like an abundant commodity. Free enables scale. With technology advances giving us more for less the free strategy spreads costs over a larger and larger base of users. Free is the best way to reach the biggest possible market and achieve mass adoption. If the marginal cost of distribution is free you might as well leverage and multipurpose your resources as much as possible by putting them out there in as many different ways as possible. Of course not everything is free as we’ve seen from the examples above. But the free building block is an essential component of new models. The more people use the free digital resource you provide the more you can build complementary services and products around it. Typically the provision of free to all is funded by complementary products and services that a subset of users pay for. Open is different than free. When things are open you can modify them, use them in whole or in part, improve them, localize them, translate them, and customize them to fit your need and purpose. Just because something is digital and free doesn’t mean it is open. There are lots of free digital things that are closed prohibiting the freedoms and permissions inherent in open. Open adds additional value by permitting change and participation in the act of creation. Open uniquely leverages the network of users by making them active participants in improving and advancing a product or service. The open strategy involves giving up control. Open sees users not just as passive consumers but as active and creative producers – co-creators if you will. Open tends to level the playing field between professionals and amateurs. New open models are not so much based on a “I know what is best” command and control strategy as a collectively we know what is best egalitarian approach. Open invites everyone to actively engage and contribute their knowledge and expertise. As we enter 2014 I’m excited about new models built on digital, free, and open. Its the combinatorial effect of the three that has such innovative potential. I see in that potential great hope for a better world. Happy new models for a new year.